Murray and Shon, owners of Bad Boys Biltong are on a fundraising mission for Pancreatic Cancer Action by taking part in their collection tin campaign – Change for Change. 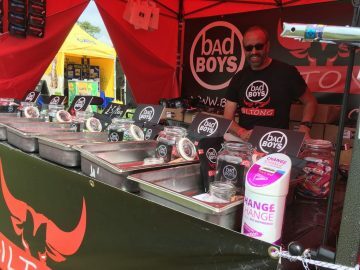 Bad Boys Biltong have a stand that tours up and down the country at food festivals and events to share their love of the South African speciality. Now, they also want to help spread awareness and raise funds of pancreatic cancer along the way! They showcased the collection tin for the first time last weekend at the Foodie’s Festival in London which picked up a lot of attention. Change for Change is an easy, effective way of fundraising that everyone can get involved in to help raise vital funds and awareness of pancreatic cancer.